Just as we were ready to leave Glenfarg, it started pouring rain. It rained all day, like it was making up for a week of slacking off. We were heading for Glasgow again, to stay a night closer to the ferry in Troon. Tomorrow we take it to Ireland. Along the way, we stopped at New Lanark. There, they've rebuilt the New Lanark Mills from the early 19th century. It was the brain-child of utopian socialist factory-owner Robert Owen. I use some of his writings in my Grade 12 history class. He had a "millennium" vision that had nothing to do with the end of the world, and everything to do with making life happy for all classes. Ultimately, the town was deserted, but not before Owen helped bring in anti child labour legislation. It was a good rainy-day activity, but more than that: it's a Unesco World Heritage site, and is now once again a working village. The story is told to visitors from the perspective of a girl called "Harmony," who lives in the 23rd century. We hear her story through projections,models and light-and-sound effects while riding on a cable car. Anica was pretty impressed with that! The cable car doesn't go up or down any mountains, but the "Millennium Ride" was certainly a unique way of moving you through the galleries. We also saw the school that Owen established, including some of the original 1820s classroom decorations. 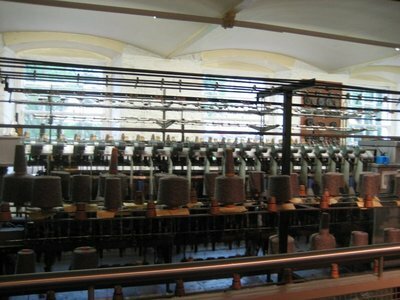 Many of the buildings, and even some of the textile mill machines, have been restored. Then it was one night (could anyone stay longer?) in an Etap hotel. Same layout in all of them, I guess: bunk bed over the double bed, one light, and as little else as possible. Etap will soon be a synonym for spartan. To brighten up the evening, we walked to the movie theatre next door and saw the new Indiana Jones movie. Due to timing and logistics, we made "dinner" out of the movie snack bar food - not a meal plan we'd want to make a habit! To get our car from Scotland to Ireland, we treated it to a boat ride today on the P&O ferry. This was one of the many advance purchases we've made on the internet in the last few weeks. It worked out perfectly, and soon we were driving (still on the left) through green and sunny Northern Ireland. The ferry was unremarkable, except for the "observation deck." The only place you could step outside was a tiny rectangle filled with smokers and a railing so high Anica still couldn't see the water. With the wind blowing, we were getting high-speed secondhand smoke, so we went back inside quickly. Now we've arrived at a town called Magherafelt, between Belfast and Derry. Magherafelt is a busy but somehow non-descript town. We're staying for five nights at a Guest House called Brooke Lodge. It's not the self-catering option we've been having, but with less than a week, this is still more affordable and more homey than a regular hotel. The "lodge" is has a few rooms, so it's like a small inn (or large b&b). 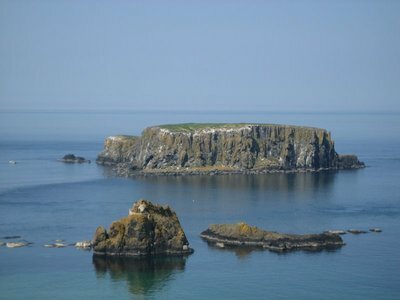 It will be our home base from which to explore Northern Ireland. For breakfast, we ordered up the "Ulster Fry." Here's what it is: back bacon, sausage, black pudding (congealed blood of sheep shaped like a urinal cake...but tasty), white pudding (same shape, different colour - made with offal or suet...but tasty), fried soda bread, fried potato bread, fried egg, tomatoes and mushrooms (both fried, of course! ), and a rack of toast. This is a traditional Irish breakfast. Well, we didn't find out what a traditional lunch is, because we were too full from breakfast to even eat lunch! That's one way we'll save this week! One of the most beautiful places we've seen on this world trip so far is the north coast of Ireland, where we were today. 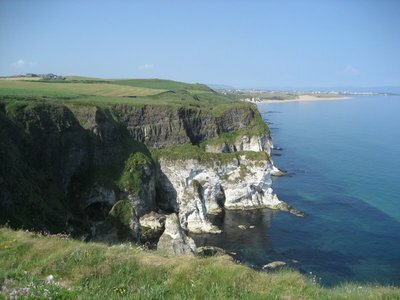 It helped that the weather was a rare treat in Northern Ireland: sunny and warm. Hot even, I think we got a little sunburnt. 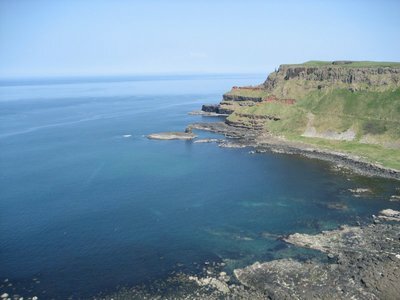 Not a cloud in the sky as we explored the Giant's Causeway coast. We fortified ourselves with a tour of the Bushmill's Distillery. It's been there since 1608, the oldest surviving distillery in the world. At the end of the tour, we each got a free drink. Anica got a Fanta Orange, and Jenn and I got whiskies. After a couple of sips, I was eyeing Anica's Fanta with envy. Whiskey is not my thing. Jenn said it was starting to go down more smoothly by the time she finished mine. Then we walked the Giant's Causeway. 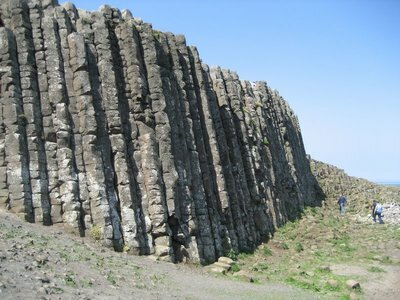 They're the hexagonal columns of rock thrown up volcanic activity in such precision that it doesn't even look natural. It looks like a modern art installation. The fun for Anica is that you can climb on them, and they make great steps. You just have to stay away from the wet ones. 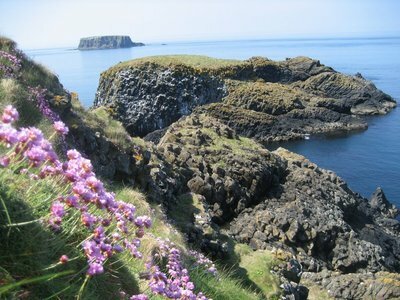 The Giant's Causeway is merely the most distinctive part of an exceptionally gorgeous coastline. It's cliffs, black rocks, dark blue and turquoise water, and lots of marine life. We did see one seal (or sea lion? ), and plenty of what we guess were gannets, swooping down from rocks and diving under water. 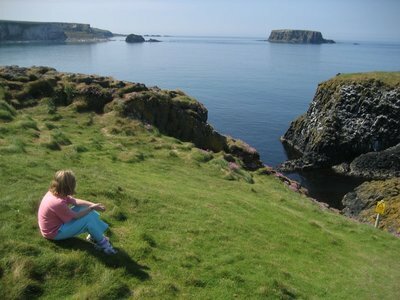 Next along the coast came Carrick-a-Rede rope bridge. 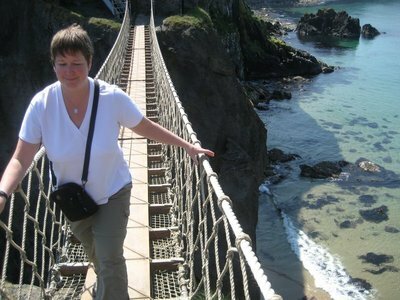 Congratulations are in order for Jenn: despite her fear of heights, she walked across (and back) this 25 metre high and 18 metre long swinging rope bridge. Wow! Anica and I did it, too. The rest of the afternoon was following the coast line, through and past the nine glens of Antrim, and then inland back to our town of Magherafelt. We drove about 200 km today, and walked about 6, so that made for a pretty nice day. The thing about Derry is that its old city walls are perfectly preserved, and make for a great walk. They were under siege in 1699, and there's some evidence and stories about that, especially when we visited the Cathedral. 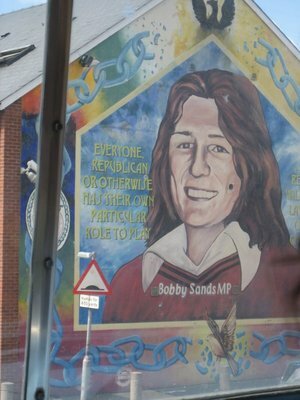 We could also see "Bogside" from the wall, with its Troubles-era political murals. One famously states "You are now entering Free Derry." The Irish flags are flying along those streets. There's also a whole bunch of the British cannons displayed up on the walls. Anica liked climbing on them. So, it was a very pleasant stroll. Even the drunk, homeless men were quite friendly. "Hello folks, don't mind us. Summer in the city!" The weird part was they were either half naked or wearing dresses. Can you really blame that on the weather? But that was it for us in Derry. Off we went, south to near Omagh, to the oddly-named Ulster American Folk Park. Not a very self-explanatory name, is it? It's like a re-created historic village, but with a few twists. First of all, most of the buildings are the original, moved from all over Northern Ireland to their new home in the "Park." Secondly, half the place is "the old world," then there's a brig/ship you climb on and through, then the other half is "the new world." It was great walking from building to building, especially walking down the 19th century Ulster street. The details are very authentic. They also have actors in costume, and at four o'clock they put on a performance to show us all the customs of a Scots-Irish wedding in backwoods America. We went from building to building with the "pastor" hosting, meeting the family members and so on. They really were having fun with their bad American accents and their improvised lines. We even got to eat the desserts from the wedding table. At the end, there was a barn dance (yes, in a barn) where they demonstrated the "Virginia Reel". Then they asked for volunteers. Here was a chance for me to put my school square-dancing know-how to use! Yes, I got to dosado and bow to my partner, and follow all those other calls I'd learned at "work" as part of the teacher's square-dance "team." One thing I've learned about this trip is that you never know what the day will bring! 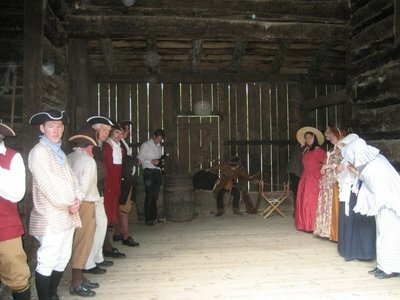 To finish their reenactment, the "bride" led everybody in singing "Shenandoah." It's June! Since it's June, we've now been on this trip for at least one day of every month in the year. Some days, however, it's like we still don't know what we're doing. At least today it worked out well in the end. We started out with the intention of going on some nature walks. There are marked trails in the Loch Neagh area. We hadn't counted on the mayflies. Wow. After a short walk, and some time for Anica at a playground right by the shore of the lake, we needed a new plan. 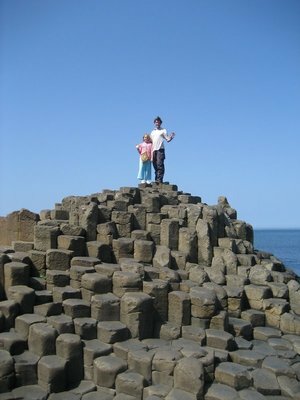 Jenn suggested going to Belfast and doing the "W5," which is a children's science centre. But Anica thought the new animatronic dinosaur exhibit sounded frightening. Eventually we convinced her that her imagination is too vivid, and that, at eight-and-a-half, she had nothing to worry about. Off we went. We were only about 35 km from Belfast anyway. W5, luckily, turned out to be a huge hit with Anica. She had a blast! We were there close to five hours, and Jenn and I also did every interactive activity we could (short of depriving a child of his or her chance!). I particularly liked their station where you could make a stop-motion animation. Anica volunteered to be part of a demo/show called "Edward Jenner and the pus-filled boil," which was about the discovery of vaccination. 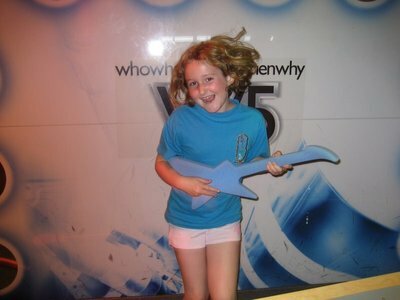 Anica rocks out at the W5! It's nice to come back to Brooke Lodge at the end of the day, because the couple that own it always ask "how was your day today" and seem genuinely interested. We remarked on the continued hot, sunny weather. "Great, isn't it, he said. "Of course, this could be our whole summer!" Our last full day in Northern Ireland and...sun! This is the not the country where you'd expect near-perfect weather, but we've had it. I hope our friends aren't in for some bad luck in south Ireland next week. Back in Belfast, this morning, we paid for a sightseeing bus tour. It's the first time we've done one on this trip, and it sure was the right city for it. 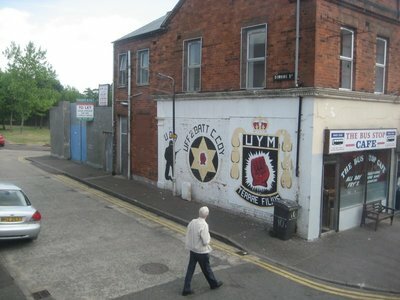 With a live, quite funny guide at the mic, we drove through the neighbourhoods where Belfast was once like a war zone. We saw the staunch Protestant and staunch Catholic neighbourhoods, and how close together they were. There's still "peace barriers" in Belfast, huge, ugly fences that keep people safe and separated. There's too much distrust to take them down yet. We saw empty lots where bombs had gone off, the infamous "two up/two down" houses, the FC supporters clubhouses, and, of course, the political murals. Fortunately, it now belongs to the past. The peace seems to be taken hold. Belfast has huge building projects going on, and while I don't believe in "progress" per se, here it seems a hopeful sign. They've actually imported ice hockey from Canada, to give the fans a non-partisan rooting interest. We noticed the signs outside the arena forbidding any team colours other than the hockey ones. Go Belfast Giants! It's almost like someone said, "Hey, those Canadians are peaceful, but hockey's a good ol' violent game - that's just what the lads need here!" In North America, the "troubles" have long been out of the news, so today's tour was a reminder about how violent things were. Jenn and I said that if we'd try to take the same world trip right after finishing high school we wouldn't have gone to Belfast...or Cambodia...or East Germany, or the Czech Republic. Oh, and maybe not China or Vietnam, either. And perhaps not Jordan. Maybe the world is safer now. Belfast is not all political murals and tenements, by the way. We saw the lovely setting for Stormont, the docklands (where they're developing a titanic project in every sense of the word), Queen's university, and a downtown core just teeming with people soaking up today's sun. A brand-new shopping mall is done in an organic outdoor/indoor blend that's really pleasant. The other thing you learn quickly in Belfast is that George Best is a god. We had an unfortunate end to our day in Belfast. Jenn, despite having consumed no further Bushmills, tripped stepping off a parking garage curb, and fell, hitting her knee, hands, and head. She seems not to have a serious injury, although is sore, and we're watching for signs of concussion after getting some ice on it back at Brooke Lodge. Jenn says we're lucky not to have had more injuries in a year's worth of travel! Today the main thing we did was drive to our Etap in Glasgow but we also stopped in Lanark. We had lunch near a grocery store before going to New Lanark Mills. The first thing we did was see a movie before going on millennium ride. It was a cable car/chair lift ride where we went with a girl named Harmony (fake), and I really, really liked it! Then I went on a climb and fall slide with a girl named Rebecca from Hampshire, England. Then we went over to the school. where we saw a show with lights that made it seem like Annie's (the kid) ghost appeared! Then I got dressed up at the school before making friends in the interactive gallery. We then drove to Glasgow where we got confused before (finally) finding our etap, having popcorn for dinner while watching Indiana Jones and the Kingdom of the Crystal Skull, went a few meters home, G.N. Today we went on a drive. We first stopped at Bushmills. Bushmills: ok, no kid likes whiskey but if you want to know what whiskey smells like go to Bushmills. You go on a tour through some smelly factories and that's it! Not! Activities and stuff was ranging from smelling whiskey to drinks to lots more on the tour! 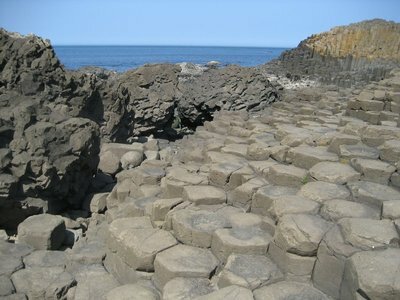 We then drove to Giants Causeway where we went down, up, down, up, down. Down: walking don the ramp. Climbing up on the rocks, climbing down the rocks. Walking up the hill, walking down the hill. I really liked climbing on the rocks. Then we went to a ropebridge where we saw a seal, swinged on the rope bridge, listened to the seals and lots more! We then drove to Ballymena. We had bagels. I got a lettuce, cucumber, bacon, sausage and mayo bagel with chips/crisps. Went home, had dinner, G.N. Today we went to Londonderry. The first thing we did was park and go to the tourisam office. We then went to St. Columb's cathdrel and then climbed all over the city walls. 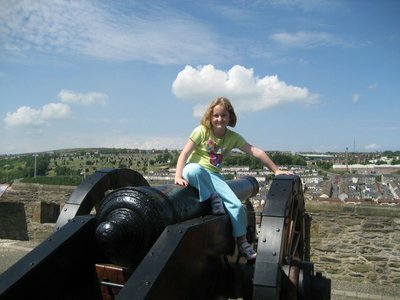 It was really fun and I liked climbing on the cannons. We diden't do a lot on the walls. We then had a lunch snack at Costa Coffe before going to the Folk Park. We saw diffrent houses, streets, ships and lots more! We also saw a wedding where we got to try food and Daddy went Barn Dancing. Went home, had dinner, G.N! Today we went to W5. Before that we went on some walks around Ballyronan. It had a playground too. But to many flies. Then we drove to the outskirts of Belfast and found W5. Now I'm going to tell you what we did and what it was: rock, noise, sound - a mix of fake guitars and music, squares that make noise and instruments that make sound. Tesco kids: a grocery store with baskets and check out stuff and shopping lists. I'm not going to tell you all the rest of them because theres to many! But I will tell you the ones I like. Water thing: ok, here's an example: me getting the balls up and falling into the thing. Mum, pushing them out of the thing and controlling the gates, Dad pushing down the balls and controlling other gates. Block fun: ever heard of blocks that make a story? How about blocks that make a cartoon? So o.k. putting in a block makes a thing happen. News reporter: from wehter to volcanoes to hurricanes in Florida. It just tells you the words and off you go. Dino Jaws: exibit of how dinos eat there prey. Then we had dinner, went home, G.N. Today we went to Belfast. We got there by A6-M22-M2. We decided to park in a shopping mall where we got me candy. We then went to the Barcleys bank before getting on the hop on - hop off bus. This was bassicly the tour: Ok theres industrial stuff, more industrial stuff, murals of bad times, etc! And it was really hot! But it was still fun. Then we went to McDonalds to have a drink and some fries. Then we went shopping. We then looked around Victoria Square mall before deciding to have Nandos for dunch (mix of dinner and lunch). I had kids meal, 3 wings + garlic bread, drink, yoghurt. Mum: 5 wings + coleslaw + drink. Dad: chicken + drink + fries. Then we went back to the car park where Mummy bumped her head, went home, G.N!